What’s going on with you? I hope these cupcakes bring a smile to your face like they do mine! By the way, do these cupcakes look a little familiar to you? If they do, it’s because I did a blue and chocolate swirled version last year and included a quick tutorial on how to do it. A reader (I believe it was Amber) had asked for a video on swirling the cupcakes and it’s been on the back of mind to do one ever since. And then I got the sweetest comment ever on this other video. It pushed me to finally do a video tutorial and because I wanted to show you how easy it is to make these super fun, beautiful and professional looking cupcakes! And let’s talk about this cupcake recipe. I changed up the usual recipe I use from Jamie’s site (less oil and used strong strong coffee this time) and went further and added mini chocolate chips! These cupcakes are officially amazing and you must try them. That’s why these are called triple chocolate cupcakes! I’m having a Bunko party tonight and it was requested that I make them so they can taste test them! Let’s go a little backwards and start with how easy it is to frost these cupcakes. The secret is to have two smaller decorator bags inside a bigger one and a nice big star tip! Here’s that video, I promised you. If you’re interested in seeing more of my videos, be sure to subscribe to my YouTube channel. I have this lofty goal of trying to do one video per week. My goal with the videos is to show you how easy it is to make something. I want them to be quick and short and hope you find them helpful! I would love to hear your feedback on them! Why triple chocolate? Because I’m using a chocolate cake mix, chocolate pudding and mini chocolate chips in these cupcakes! First thing I do is coat the chocolate chips in 3 Tablespoons of the cake mix so when you mix in the chips, they don’t sink to the bottom. 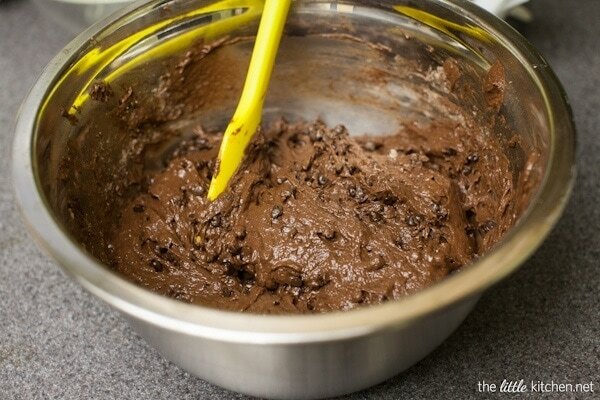 Mix all of the ingredients together with an electric mixer and then mix in the chocolate chips with a rubber spatula. This batter looks like pudding to me. I have to resist from eating the whole bowl. 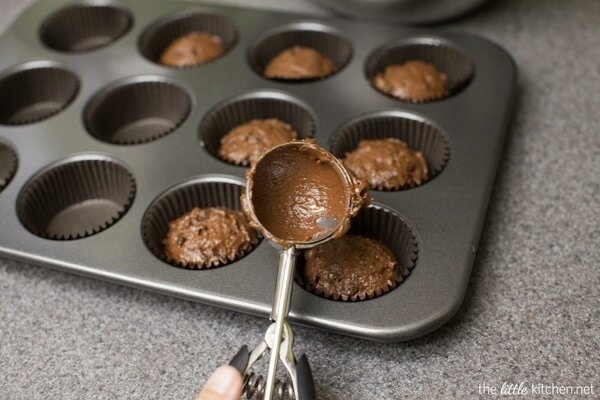 Using a large cookie scoop, scoop batter into a lined cupcake tin. Bake 18 to 20 minutes and allow to cool before frosting them. You’ll be in chocolate heaven! The wonderful thing about the swirled frosting is you can do whatever color combination you want! 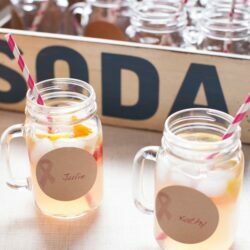 You can your team colors or colors that coordinate a wedding or a baby shower. Have fun with it. Next time, I want to try green and pink together! Tip: If you’re making a color combination with chocolate, make the vanilla buttercream first and you won’t have to clean your stand mixer bowl when you go to make the chocolate buttercream. Heat oven to 350 degrees F and line two cupcake tins with cupcake liners. 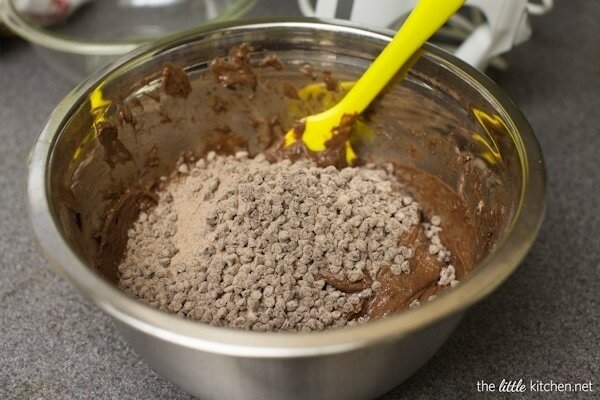 In a small bowl, mix the mini chocolate chips with 3 tablespoons of cake mix and set aside. In a large mixing bowl, add the remaining cake mix and pudding mix. Using a rubber spatula, mix together. Add vegetable oil, sour cream eggs, coffee, water and vanilla and mix together with a spatula. Using an electric mixer, mix the batter thoroughly until ingredients have incorporated. Occasionally use the rubber spatula to scrape the bottom and sides of the bowl. 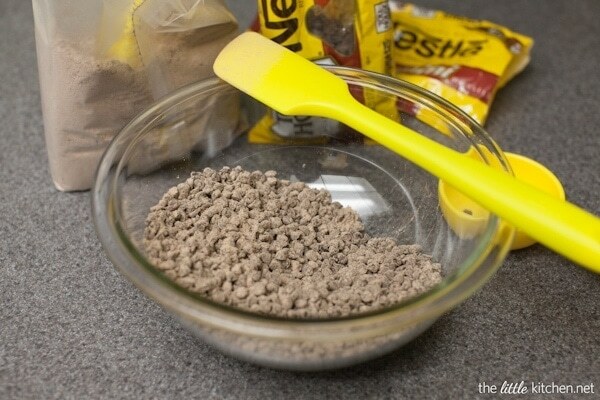 Add chocolate chips and stir with rubber spatula, just to combine. 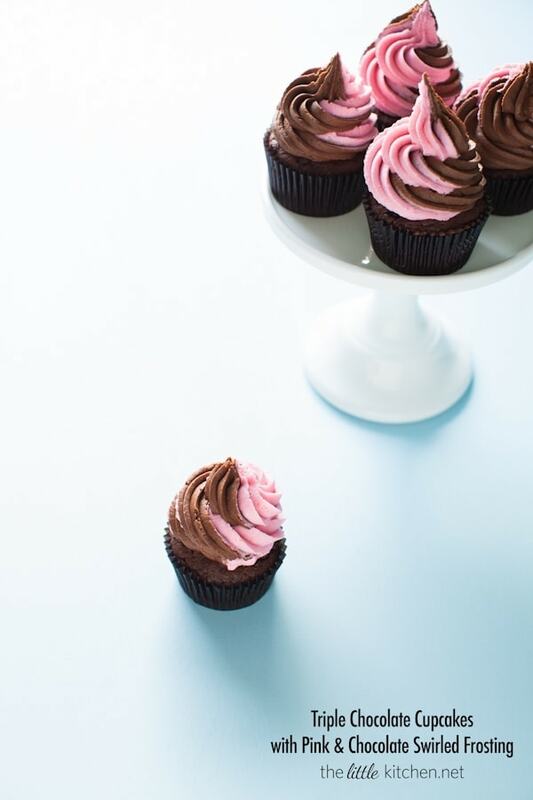 Using a large cookie scoop, scoop batter into cupcake liners and bake for 18 to 20 minutes or until poking the center of several cupcakes with toothpick results in a clean toothpick. Allow to cool for 2 to 3 minutes in the cupcake tin. Carefully remove from cupcake tin using an angled spatula and allow cupcakes to cool on a cooling rack. In the bowl of a stand mixer, add both butters and shortening and cream together at a medium speed. Then, add vanilla extract and mix thoroughly. Add half of the confectioner's sugar with the stand mixer turned. Mix well at a low speed. Then, add the rest of the confectioner's sugar. The mixture may look crumbly or curdled. With mixer on at a low speed, add milk one tablespoon at a time. Add more for creamier and thinner frosting, use less milk for thicker frosting. Be sure to scrape down the sides of the bowl a couple of times. Once milk has been added, turn mixer to medium speed and allow to mix for 3 to 4 minutes. Store in the refrigerator when not in use. Allow to sit on the counter for about 15 to 20 minutes and whip with angled spatula before adding to piping/decorator bags. Sometimes, I add a little bit of water to it while I'm whipping and it gives a nice creamy texture. In the bowl of a stand mixer, add butter and shortening and mix together on a medium speed. Add cocoa and vanilla and mix on low speed until combined. Add half of the confectioner's sugar and mix on a low speed. Add the rest and the mixture will probably look crumbly. One tablespoon at a time, add the milk until you get the consistency you want. Mix on medium speed for 3 to 4 minutes. Same with the vanilla buttercream, store in the refrigerator when you're not working with it. Set up your decorator bags I put my decorator bags inside a glass (I used a stemless wine glass). Measure out one cup of frosting and fill the bag with an angled spatula. Then, do the same in another decorator bag for your other color. Then, cut the tips of both bags at the same spot. Add rubber bands to the tops of both decorator bags, so the frosting doesn't go out the top when you squeeze them. Fit your 16 inch decorator bag with a large open star tip. 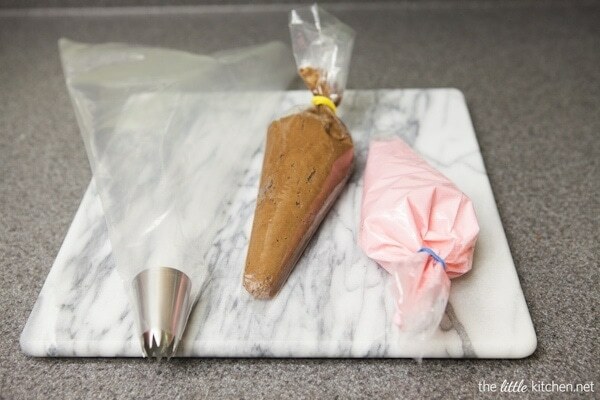 Add both color frosting bags to the larger one and make sure both of the frosting colors match up inside the star tip. 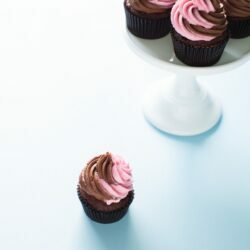 To frost the cupcake, lace the tip at a 90 degree angle on top of the cupcake off to the side. Keeping the same angle and with an even pressure, squeeze the decorator bag while moving in a clockwise motion about two or three times. When you're near the end, pull away and stop squeezing to get the finished swirled frozen yogurt look. Repeat for the remaining cupcakes. This will frost about 5 to 7 cupcakes depending on how much frosting you use. To frost the rest of the cupcakes, you'll need to remove the smaller bags and refill them. It may get a little messy and you may need to clean the inside of the start tip or use fresh new 12 inch bags. For a quick demo of frosting these cupcakes, check out my video. Chocolate Cupcake recipe modified from My Baking Addiction. Buttercream Dream recipe slightly modified from Cake Central. Chocolate Buttercream recipe from Wilton. 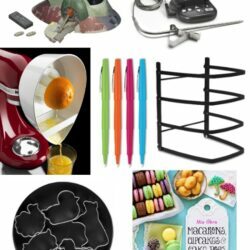 Disclosure: There are affiliate links in this post. That means if you click on it and purchase anything, I make a little bit of money. Thank you so much! I love two toned icing on cupcakes! Love the video too! These cupcakes are gorgeous! I’d love to do neapolitan cupcakes like this! That looks so good Julie! I always wondered the secret to your beautiful swirled cupcakes. Love that frosting! These are gorgeous! Cute video- short, sweet, and helpful! Great looking cupcakes! And a great little video tutorial. I haven’t tried a color swirl before, but I think I’m gonna have to soon! 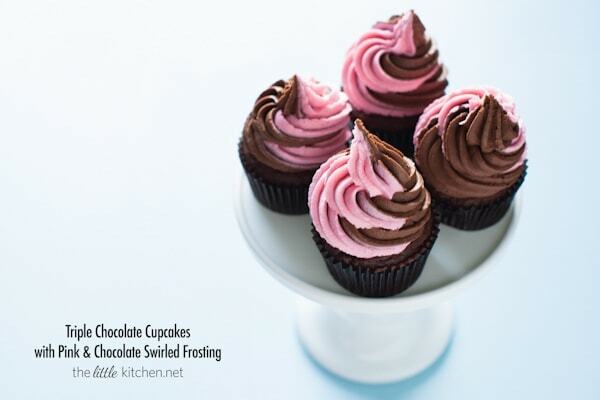 Such pretty cupcakes, loved the swirled frosting and your video – great tips! Oh, these look so good! I love the swirl. How cute are these cupcakes, Julie?! Love the fun little swirl!! Yes, these put a big smile on my face!! So cute!! I love the video, you did an amazing job! Great video Julie. With all the cupcaking I do, I have yet to do a swirl frosting. Thanks for the awesome video! I shared it on my FB today! What a great tutorial! I only want to frost with swirls from here on out! Gorgeous! I love that pink swirl so much. Julie, these are so cute!!! Cutest cupcakes ever! I love this technique! Talk about impressive! Julie–great video! And being that I’ve tasted this in real life I can say that they are amazing!!! ah! These look so good! These are so adorable, Julie! Hope you’re enjoying a nice summer! These are absolutely stunning! Love, love, love that top shot. Two thumbs WAY UP! these look delicious! and the 2 color topping trick? just great! These are so pretty! I want one. And love the idea of videos! Beautiful and delicious! The cake was sooooo moist. And for some reason, the first picture in the post reminds me of an Oreo ad. Thanks so much for the video, Julie! I’m such a visual person, it’s always so helpful to see someone doing something as opposed to just reading instructions. Your cupcakes look incredible and I love the two tone frosting. I’m making cupcakes for my little sister’s bridal shower so I should totally try doing this. I am so bad at frosting cupcakes–you make it look easy though! Oh goodness, these cupcakes are to die for! Triple chocolate is right up my alley 🙂 and the swirl is adorable! These are gorgeous Julie! I love the swirl. Definitely smile-inducing! Those seriously are such happy looking cupcakes! I love how easy it is to do that two tone frosting!! These cupcakes look delicious! So pretty too! Julie, loved your video. You made it so anybody could do the job.